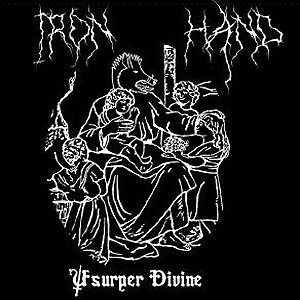 Iron Hand come to us from various parts of Connecticut and Massachusetts. They feature some ex-members of They and The Children and Schematic of a Walking Life. The delivery here seems to be similar to a band like Tragedy or His Hero is Gone. It's a dark sound that stays on the fast side of things, but all the while avoids the discordance in exchange for some melody that wains to the serious side. The production here is pretty solid. The guitar tones are very well rounded out and the drums carry some nice roomy echo to them. There's an interesting line of guitar work in the beginning of "Phobia" which later morphs into a guitar solo that had me thinking of something that sounds like Bad Religion being mixed with some Motorhead; in that, the melody is there, but the solo seems to stick to the harmony exclusively, not trail off into some inane, showy mess of scales. "Short Sighted" finally shows the band breaking the d-beat style for a moment to let off a two step intro. Now that I hear it, I find the one complaint I have to this record is the lack of variation at times. They bring the two step back with a Majority Rule sounding guitar lead over top later in the song and even add a palm muted stomp after the fact. It works so well that I scratched my head wondering why this band isn't doing this more. non-abstract way, making it pretty simple to connect with some of the sentiments.